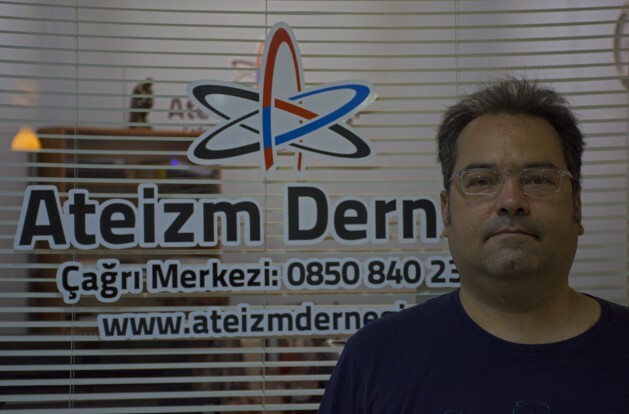 ISTANBUL, Jun 24 2014 (IPS) - “Being an atheist isn’t something you can easily express in Turkey,” says Sinem Köroğlu, a member of the Atheism Association, the first official organisation for atheists in the country. “It’s becoming more difficult with the current government as well,” she adds. Set up earlier this year in Istanbul, the aim of the Atheism Association is to give a voice and support to non-believers in Turkey, a country not known for its fondness of atheists. Politicians in the religious conservative Justice and Development Party (AKP) have been making hostile comments about atheists. Last year, a high-ranking member of the party, Mahmud Macit, used Twitter to attack “spineless psychopaths pretending to be atheists”, saying that they “should be annihilated.” Prime Minister Erdoğan himself has also insulted protesters by calling them “atheists and terrorists”. A survey carried out by Istanbul’s Bahçeşehir University in 2011 found that 64 percent of respondents would not want to have an atheist for a next-door neighbour, 72 percent would not want someone who drinks alcohol, and 67 percent would not want an unmarried couple. The Atheism Association has also received threatening phone calls, which members say they had expected all along. “I didn’t take them too seriously,” says Tolga Inci, one of the founders and interim chair of the association. Inci says his organisation has already been attacked in the press by religious papers such as Haber Vaktim and Milli Gazete.” They said we will attempt to spread atheism and wage a war against religion,” he answers with a laugh. Köroğlu insists that the association is not trying to start a war or convert anyone. It just wants to spread awareness about atheism and to support Turkey’s non-believers. According to Inci, religious discrimination in Turkey has increased in recent years, coinciding with the rise to power of the AKP. But he thinks that now the situation “has become worse.” Noting that “with the AKP, they talk about religion all the time.” Inci says this makes not only atheists, but many less devout people and religious minorities uncomfortable. Turkey was established as a staunchly secular republic in 1923, but Inci thinks that it is becoming more publicly religious. “We want our secularism back,” he says. Of Turkey’s 74 million people, 99.8 percent are Muslim, and 80-85 percent of those are Sunni. However, there are also 10-15 million Alevis, a heterodox sect of Shia Islam known for its more relaxed religious customs, and smaller numbers of Christians, Jews, and atheists. A Eurobarometer poll in 2005 found that 95 percent of Turkish respondents believe in God, while a Pew poll of 2006 reported that 69 percent said religion is “very important” to them. Turkey’s educational curriculum includes a mandatory religious class that focuses almost exclusively on Sunni Islam. All citizens must carry ID cards declaring their religion, and being an atheist is not an option. State-provided burial services exist for Islamic funerals only, with cremation forbidden in Islam – but many atheists do not want to be buried in Islamic cemeteries. The colossal government department responsible for religious affairs – the Diyanet – only promotes Sunni Islam. Since the AKP came to power in 2002, its budget has more than quintupled and the number of employees has increased from 74,000 to over 141,000. The current Law 216 on hate speech makes it illegal to insult religious values and has been used to prosecute several high profile figures such as world-renowned classical musician Fazıl Say, and linguist and writer Sevan Nişanyan. Both were prosecuted for online comments deemed to be offensive towards Islam. Akyol believes that Law 216 has an important value in suppressing hate speech, but that it should not be used to target people like Say and Nişanyan. “Criticism of religion should not be a crime,” he says. Akyol, himself a devout Muslim, stresses that Islam has been historically accepting towards non-Muslims, citing the Ottoman Empire’s tolerance towards religious minorities. He notes there are still many young Muslim intellectuals who do not demonise atheists and are willing to engage in civilised dialogue. Meanwhile, the Atheism Association is planning to provide free legal support to anyone charged with blasphemy, organising seminars, and conducting a survey on religious beliefs in Turkey. They want religious classes in school to be optional, state-provided funeral services for non-Muslims, and crematoriums to be opened in Turkey. I find the majority of atheists I meet, to be more respectful and tolerant of others than most religious people(all religions)Just look at the hatred and violence being carried out around the world at this very moment, in the name of ??? Religious people hate those who criticize their dogma’s. In the USA, many Christians would rather have a Islamic president then a atheist one. Those who reject God are even more hated then Muslims in America. My personal experience is I have never encountered a more hateful group of people than atheists. Respectful and tolerance by atheists is garbage, hatred towards any religion is more accurate. My comeback to atheists is “if you don’t care about religion why does it upset you so”. There is a huge difference between an atheist and some one who is simply bored by and ignores religion.